At Urban Shield’s vendor expo, a hundred companies sell military grade weapons and surveillance equipment to local police departments. As much as organizers claim Urban Shield is about saving lives, the focus on guns and death is overwhelming. City agencies should not participate in an exercise that militarizes the police. 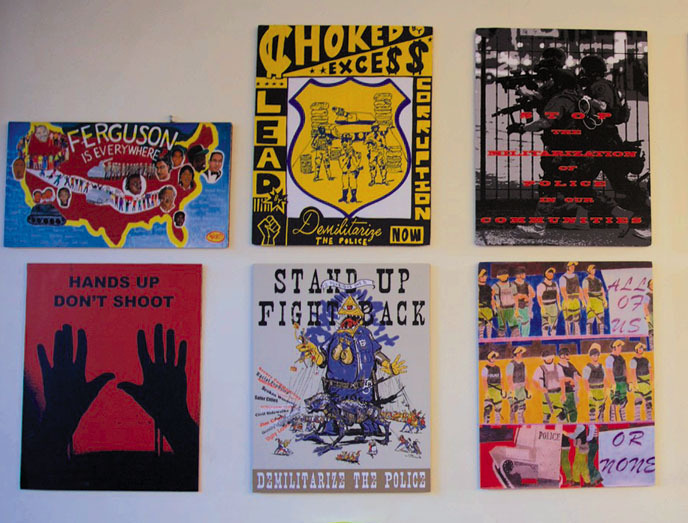 “Humanize Not Militarize.” The AFSC art exhibit shows the effects of militarism from Urban Shield exercises to Ferguson, Missouri, to Gaza. The use by police of military tactics and equipment in the East Bay is no accident. Federal and local funding and equipment flow to law enforcement throughout the country, and the Bay Area is no exception. San Francisco applied to the Pentagon to get a wheeled tank, known as a Mine-Resistant Ambush-Protected vehicle. Berkeley deployed a SWAT team in full military gear to a residential neighborhood in response to a robbery of $40 from a laundromat. In the promotional video for the federally funded Urban Shield exercises, simulations of violent confrontations with police commandos are accompanied by dramatic Hollywood music, as if this were a movie for our entertainment. Urban Shield is a vendor expo for military equipment and a massive exercise for SWAT teams and other agencies, hosted each fall by the Alameda County Sheriff’s Department. It’s the largest such “tactical exercise” in the country. Taking place this year on September 11, it involved at least three dozen police SWAT teams from the Bay Area, as well as from other states and nations. The exercise is funded by grants from the Department of Homeland Security as part of the Urban Areas Security Initiative (UASI), a national program of more than $500 million a year. In addition, Urban Shield seeks to prepare police, fire and medical personnel for non-criminal emergencies, such as the collapse of buildings and rail and ferry boat accidents. But Urban Shield’s SWAT teams and scenarios of militarized policing are more numerous than all fire, medical and explosive disposal teams and exercises combined. While most SWAT teams are from the Bay Area, they have come from as far as Israel, Bahrain, Qatar, Brazil, Guam, South Korea and Singapore. The emphasis on SWAT teams as the response to emergencies — including natural disasters — as well as the exclusive focus on worst-case violent scenarios, obscures and diminishes resources for responding to the ordinary emergencies community members face every day: inaccessible housing and medical care, militarized and underfunded schools, racist violence and violence against women, fossil-fuel dependent and expensive transportation, food insecurity, etc. It also reinforces an attitude that police are at war in their own communities, with people of color, homeless, poor and mentally disabled persons bearing the brunt. For most operations of SWAT teams are not in response to emergencies. According to a study by the American Civil Liberties Union, 79 percent of SWAT team deployments in 2011-2012 were to serve search warrants, mostly for drugs. More than half the people impacted by SWAT raids — where the race of individuals was known — were African Americans. 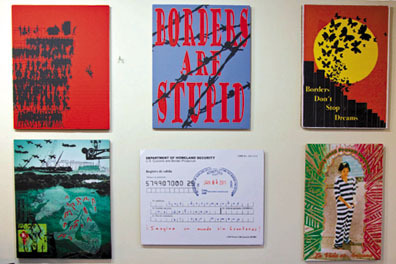 A new poster art exhibit by the AFSC shows the effects of military violence in foreign and domestic settings. At Urban Shield’s vendor expo, a hundred companies sell military grade weapons and surveillance equipment to local police departments. These include companies doing business in the occupied territories of Palestine, such as Motorola, 3M, FLIR, iRobot, Exelis (formerly ITT), and Safariland. The literature and T-shirts displayed at the vendor event illustrate the thinking offered at Urban Shield. These include American Spartan Apparel, whose T-shirts say things like: “That Which Does Not Kill Me… Should Run” and “Keep Calm and Return Fire” and “Destruction Cometh: And They Shall Seek Peace, and There Shall Be None” — many of them with skulls and crossbones and guns. How exactly do these sentiments help prepare publicly funded agencies to save lives? As much as people want to say Urban Shield is about saving lives, the focus on guns and death is overwhelming. Moreover, the emergency scenarios in the SWAT exercises do not reward de-escalation of conflict. Urban Shield is run by a tight network of Sheriff’s Department veterans and cronies. The major contractor for the exercise, at least in other cities in past years, was Cytel Group, run by ex-Alameda County Sheriff’s Department staff. Several of the companies vending their wares at the expo have been generous campaign contributors to Sheriff Ahern’s re-election bids. 511 Tactical, for example, gave $35,159 worth of contributions to Ahern’s campaign in August 2011 and is a “Title-level Sponsor” of Urban Shield. 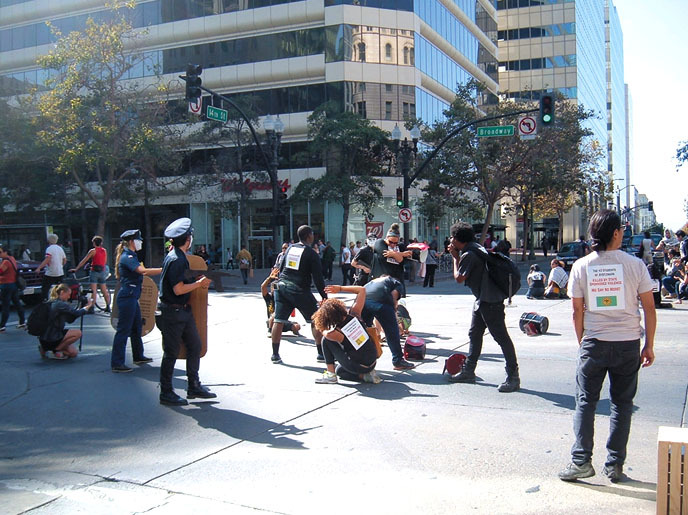 Theater groups occupied street intersections in downtown Oakland in protest of Urban Shield exercises and police repression. Corizon Health, a “Platinum Sponsor,” also profits from health services in prisons, and contributed $55,000 to Ahern’s Campaign Committee from 2011 to 2013. That is more than his campaign spent in all of 2014. Adamson Police Products, a “Triple Diamond Sponsor” of Urban Shield 2015, gave $17,300 to Ahern’s campaign committee between 2009 and 2013. While Urban Shield is funded by a federal grant to the Alameda County Sheriff’s Department, it does not fund the pay, including overtime, of city and county agencies participating in these exercises, which commit substantial amounts in overtime pay not covered by UASI grants. Sheriff’s Department sergeants and deputies cost about $81-$97 per hour for overtime. For 48-hour continuous exercises on the weekend by teams of eight and more staff, this cost alone is significant: at least $34,000. In 2012, activists in Oakland began organizing to push back against Urban Shield, which had been headquartered at the city-run Marriott Hotel in downtown Oakland. They formed a coalition of organizations, including American Friends Service Committee, Critical Resistance, War Resisters League, Arab Resource Organizing Center, Oscar Grant Committee, CodePink, Oakland Privacy Working Group, and others, as well as families of people killed by police. The coalition organized street protests at the Marriott, joined by a feeder march by families of police murder victims. Many artists are finding creative ways to speak out against the lethal violence of destructive weapons technology. Last year, protests were energized by the response in Ferguson, Missouri, to the killing of Michael Brown. Buddhists sat in engaged meditation in front of the Marriott Hotel’s doors. Congresswoman Barbara Lee reportedly urged then-Mayor Jean Quan to cancel the contract to host the event in Oakland. After all, Oakland has sharply curtailed gun-selling in its jurisdiction. Why should it then sponsor an event for vendors to sell military gadgetry? Mother Jones magazine published an extensive report on Urban Shield, after its reporter was thrown out by Urban Shield’s media flacks. Ultimately, Oakland did kick out Urban Shield. In response, the Sheriff’s Department moved the event this year to the county fairgrounds in suburban Pleasanton. A Pleasanton police officer only recently killed John Deming, Jr., an unarmed young man in July. The centerpiece event was a protest on the first day of Urban Shield, on September 11, part of a contest over the meaning of terror, who is impacted, and how to respond. Marching through downtown Oakland to the Alameda Sheriff’s office, theater groups occupied street intersections and enacted repression by police of Black, Filipino, Mexican and Arab communities and their responses. Oakland police stayed away. In powerful testimony in the shadow of the Sheriff’s office on Lakeside Drive, a local 13-year-old girl described a SWAT raid on her home. “As soon as I hit the door, I opened it, and they started screaming at me, telling me to put my hands up. Pointing rifles at me. And I look around, and it seemed like a movie. I couldn’t believe it.” She was brave beyond words to describe her experience in public. Alameda County should not be hosting this large event, which involves not only nine Bay Area counties, but teams from beyond the Bay Area and the United States. But neither should individual city agencies participate in an exercise that militarizes emergency responses and ordinary policing. Our communities badly need other kinds of security, instead of fortifying the state’s violent responses to protest and crisis. Stingray technology mimics the signal from a cell phone tower to capture data from all cell phones within a wide area. In a small victory for activists, the Board of Supervisors postponed their decision on the Harris contract to allow more time for public input. John Lindsay-Poland is the Wage Peace Coordinator for American Friends Service Committee in San Francisco. 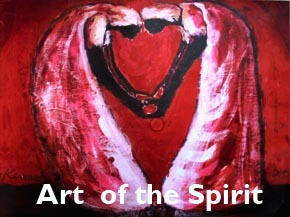 He can be reached at jlindsay-poland@afsc.org. Thanks to researchers who contributed to this article, including Dalit Baum and Mike Katz-Lacabe.